You read the title right reviews not review. I was contacted by the lovely people at Parragon to see if I would like to review one of their books, I was only expecting one book, so imagine my surprise when a package turned containing not one but four books in it, so I thought I would put all four reviews in one post. I can't tell you how grateful I was to receive four books to review. It meant that there was one for each of my daughter's to have a look at, no arguing for once. Parragon is a publishing company that started in the lated 1980's. Although now based in Bath UK, they have regional offices all over the world. Their main publishing areas are cook books, adult non-fiction, children's books and licenced character books. * The Ladies Book of Baking which is part of their Love Food collection. 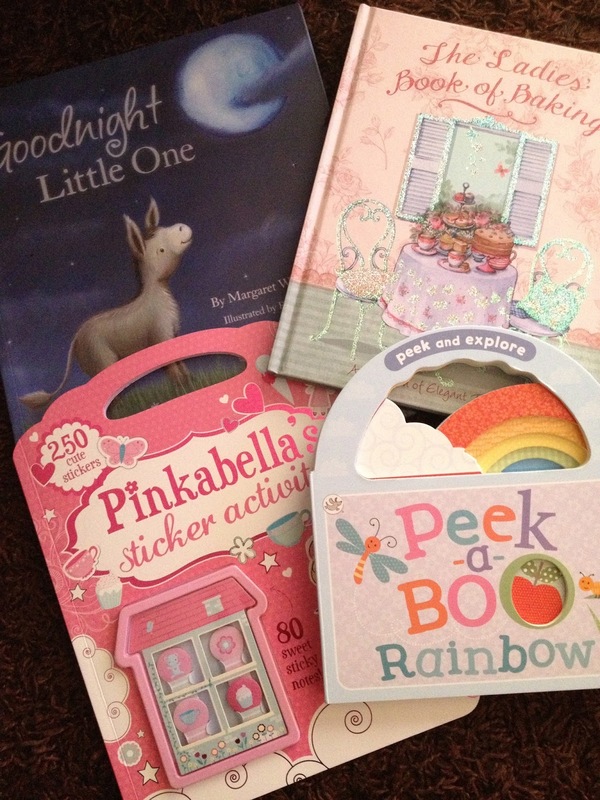 It was decided that Peek-a-boo rainbow would be Layla's, Goodnight Little One would be Freya's, Pinkabella's sticker activity book would be Gracie's and The Ladies Book of Baking would be Elise's, although they were also told that they had to share their books with their sister's, not that Layla really understood that part, the art of sharing is something she is yet to learn but you are never too young to start learning!! Layla loved Peek-a-boo Rainbow immediately. It is a gorgeous little book that in my opinion is great for babies and toddlers. For babies, it is colourful, full of fantastic little pictures, from ladybirds to caterpillars, it really is eye catching. I especially love that at the top of the book there is what I would describe as a handle. This is very handy for small hands to be able to carry their book around with them. It can be a great learning tool for toddlers too. Each page gives you a different colour of the rainbow, this means your little ones can slowly learn their colours. With pictures on each page, you can ask your child what they are looking at, what colour a certain object is, how many of something can they see. Then there is the added peek-a-boo hole. What can they spy through the hole? There are so many things to keep your little ones interested and best of all you can ask them different questions each time you read the book, keeping it fresh and exciting. Very simple but cleverly put together. This book works well for when your child wants to sit and do something by themselves but it also a lovely book that you can sit and enjoy together. Gracie like many other children, is a huge fan of stickers. I find them stuck to random places around the house all of the time!! So Pinkabella's sticker activity book was a perfect fit for her. With 250 stickers inside, this book kept her occupied for hours. Being pink it was a lovely and girly. I was able to sit down with Gracie and help understand where she needed to place certain stickers. The stickers came in all shapes and sizes and were very easy get out. I was pleased to see that this wasn't just a sticker book, there were other activities inside to keep Gracie entertained. There were puzzles and pictures to colour. Her older sister's actually took the time to sit down with her and help her complete the activities, Freya even wrote Gracie's name at the beginning of the book so that everyone knew that it was hers. Just like Peek-a-boo Rainbow, there was a little handle at the top of the book, Gracie took great pleasure in carrying her book to Nannie's house, gave her a little bit of independence looking after something. Once the book had been completed, there were still stickers left, so the fun didn't stop there. We got lots of paper out so that they could create some pictures of their own with the remaining stickers. Parragon have a lot of other sticker, colouring and activity books to choose from, I think these books would make great Christmas presents. Freya picked Goodnight Little One by Margaret Wise Brown to be hers. My little girl is apparently all grown up and since starting school last September, can read most words all by herself so she took herself off to read it by herself. I finally managed to pry it from her so that I could have a look too!! The book itself is a lovely size. I like slightly bigger books sometimes and as I see this being read at night time, I think you need it bigger to be able to fully appreciate what you are looking at. The story isn't too long. The flowing words make it almost sound like a lullaby and the beautiful illustrations that go along with them really bring the book to life, they compliment each other. I think this book is a perfect bed time story and it can be read to babies, toddlers and children, I feel it is a book that could soon turn into a classic. The last book was The Ladies Book of Baking, this suited Elise to a T, more because she sound so posh, she is the complete opposite to her mummy, common as muck me. This is a fab book for anyone that enjoys baking or even for people wanting to try their hand at baking. With recipes for cakes, biscuits, pastries and much more, you will be able to make something different every week, although I can see my hips expanding with all the yummy things to be made. Each recipe is presented clearly. You can see exactly what ingredients you need, how many it will serve, how long it will take to make and bake and the method of how to make them is broken down, so even a novice would be able to make these without going wrong some how. What really makes this book stand out is that there isn't just recipes inside. It tells you how you can present your cakes at things like tea parties, how to make invitations to your party, how to wrap up your cakes and biscuits so that you can give them to people as presents. The girls are looking forward to making a few of the cakes and biscuits during the Summer holidays and I am now thinking about making a few and giving them to people as gifts at Christmas. Each of these books that I have reviewed I would recommend to different people. Well written, beautifully presented, just all round quality. They have now all found a place on our bookcase!! Disclaimer : I was sent these books free of charge for reviewing purposes, however all thoughts and opinions are my own.